Visuals useful in teaching and learning can be found throughout the project websites hosted at SERC. Here are some strategies for locating the perfect image, diagram, map or video. 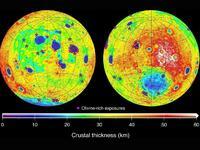 For Geoscience Visuals start with the On Cutting Edge Teaching with Visualization Site. Visuals often live within pages that describe activities. Try searching for teaching activities that cover the the topic you're interested in. Individual projects often have collections of visuals. In addition to searching all of SERC or in Teach the Earth, these sorts of searches can be used effectively within the project-specific searches available in most project sites. On Cutting Edge Teaching with Geoscience with Visualizations - A rich site that includes information on principles for effective visualizations, ideas for teaching with visuals, and best practices from cognitive science research. Browse over 70 different examples of geoscience activities that use visualizations. 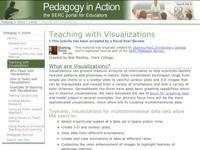 Teaching with Visualizations - This module focuses on how to teach with sophisticated visualizations, which allow students to visualize multidimensional data. The module includes a set of example activities. 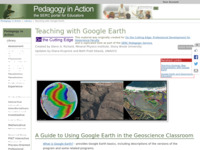 Teaching with Google Earth - A guide for educators with clear instructions, tips for the classroom and over 20 examples of Google Earth activities. See also Teaching Geologic Map Interpretation with Google Earth. 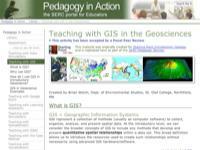 Teaching with GIS - This module helps faculty get started with using GIS in the classroom and contains example activities. Direct Measurement Videos features short, high-quality videos of real events that students can use to explore and apply physics concepts. The videos can be used for labs, homework, assessments, or open-ended problems. Several of the videos are paired with classroom-ready activities that integrate videos into the introductory mechanics curriculum. What sets these videos apart from others is that students can measure distances, time, angles, and other variables right from the videos, allowing for a wide variety of quantitative and theoretical exploration.